Closed-loop marketing is a term that has been around for some time. 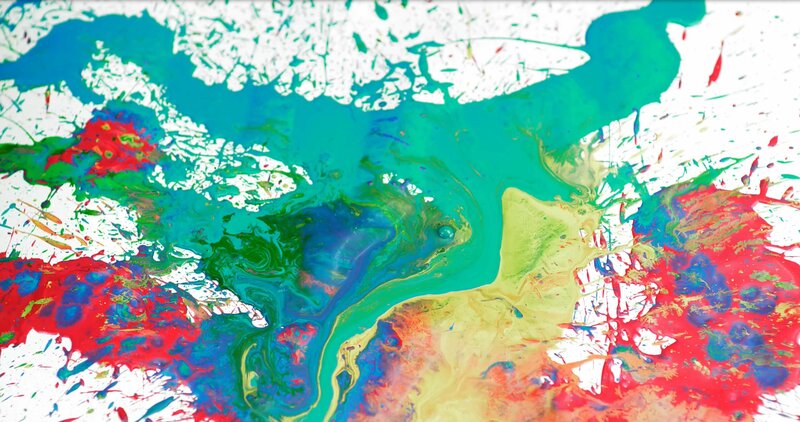 While there are plenty of tools out there today that make having this process a reality, it can still prove challenging for companies to implement a true closed-loop process. Too often, marketers still build content based on assumptions rather than actual ROI numbers because they don’t know how to tie revenue numbers back to their campaigns. What exactly is closed-loop marketing? Here is HubSpot’s definition: "Closed-loop marketing is marketing that relies on data and insights from closed-loop reporting. ‘Closing the loop’ just means that sales teams report to marketing about what happened to the leads that they received, which helps marketing understand their best and worst lead sources." 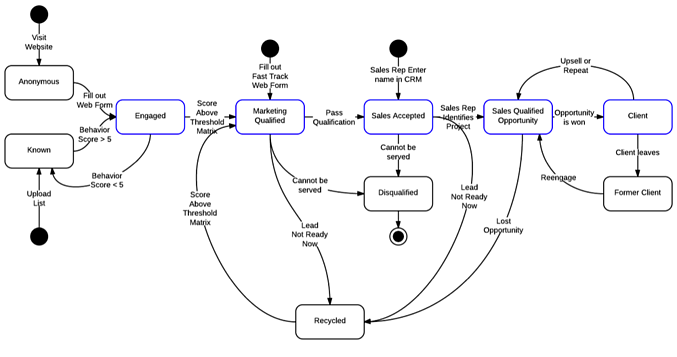 Closed-loop processes tend to be organization specific but what they all have in common is a reporting mechanism that starts from the lead funnel (generating the lead) and continues all the way through the sale and beyond (think of customer referrals). Closing the loop is meant to bring understanding to where your opportunities came from. No lead is left behind and every lead can be tied back to its origin (hopefully) and the many interactions in between. In this 3-part series, we are exploring how to get started with a closed-loop marketing process, how to analyze and improve on it, and lastly, how to implement it within HubSpot. Understand your sales process: We have seen it time and time again that marketing is not involved enough in the depth of the sales process. The marketing team (especially the marketing operations team) has to know the sales process in and out, from follow up calls to the opportunity stage. If you are new to an organization, make sure to carve out some time to speak to the sales team. Listen in on some prospect calls and have your sales reps walk you through the CRM tool and opportunity creation process. Make sure you understand every bit of the sales process as this is the backbone of building out the correct reporting mechanism for your closed-loop process. Agree on roles and responsibilities: We mentioned this before in our blog about Smarketing and it's worth emphasizing again how extremely important it is to understand everyone’s role in the process. For example, which leads are being touched by marketing? Which ones will sales follow up with directly? How is sales reporting back to marketing on the success of their touchpoint? What are the SLA’s in place (i.e: how quickly is sales going to follow up on a lead and disposition it, etc.)? Agreeing on the answers to these questions upfront will save you the potential headache down the road when you are in the middle of setting up your process and come to an unanswered halt. Set clear goals on what you want to achieve: Setting a goal might sound like it would be an easy task, yet we frequently see many organizations aimlessly implementing different processes without an objective in mind. Even if you don’t have conversion numbers to work from, make sure you set goals based on benchmarks. Don’t feel guilty if you have to revise your goals throughout the process because its better to hold yourself accountable rather than to not have any goals at all. Same goes for timelines. If you don’t set a target date for when your process should be up and running you risk facing procrastination and possibly never finishing it up at all. Besides, most of us will agree that goals work better when given a time constraint. Build your buyer profile and persona: Before you get started with building out any content or process, you have to understand your buyer profile and ideal buyer persona. Why is this important? For one, so you can provide your ideal buyers with the tailored content that is relevant to them and two, so you can prioritize them over leads that might not be relevant to your business. Map out the buyer’s journey: Mapping out the buyer’s journey will not only help you understand the different stages a buyer goes through during a purchase, but it is also a good starting point for your visual map (see part d.). 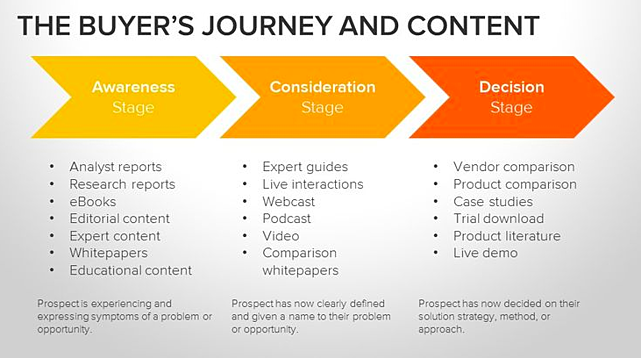 HubSpot divides the buyer’s journey into three stages: Awareness, Consideration, and Decision. During the Awareness phase buyers understand they have a problem, they ‘feel the pain’ as sales sometimes call it. In the Consideration stage the buyer has defined the problem and is looking for solutions. Lastly, in the Decision phase, as the name suggests, the buyer makes a choice. Agree with sales, customer success and management teams on the process: Make sure all internal constituents agree on the process and that every individual understands it and their role in it. Build out your content and assets: Repurpose older content such as papers, eBooks, landing pages, emails etc. Give them a re-write or design facelift. Create new content. Use a marketing automation platform: Use marketing automation tools like Marketo and HubSpot to build out the process. We’ll talk more about these platforms in part 3 of the series. Report, analyze & refine: A closed-loop process needs constant attention and should be modified as needed. Make the time to keep your pulse on any trends, tools and market changes and adjust the process as needed. In Part 2 of this series, we’ll focus a bit more on this and discuss how to build the right reports and improve conversions. If you would like to learn more about the closed-loop marketing process along with how to successfully align sales and marketing, set up a consultation with us here. Stay tuned for part 2 where we’ll take a look at conversion rates, reporting, and more. Last but not least, part 3 will include tips and tricks on how to set up a closed-loop marketing process using HubSpot. Make sure to subscribe to our blog to receive the follow-on posts directly to your inbox. 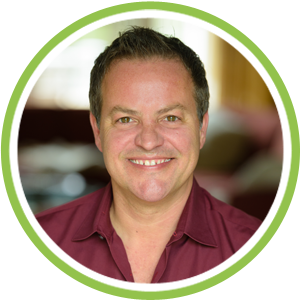 Before starting Scholes Marketing in 2005, Jeff was a marketing leader in a variety of Boston-area technology, software and startup companies. Jeff holds a BS from the University of Rhode Island and an MBA from Suffolk University. Jeff's an avid traveler, obsessed with his Norwich Terrier (Chienny-Benny), enjoys a good laugh and having intimate dinners in or out with his husband Paul, family and friends.